Oswamène and her family live in the small town of Caberet in northern Port-au-Prince, Haiti. Caberet has a population of about 20,000. Because of its geographical location, it is prone to frequent flooding. As is the case in many regions of Haiti, Caberet is vulnerable to diseases such as malaria and cholera due to the lack of sanitarian infrastructure. Oswamène and her 21-month-old twin sons are blessed to be part of the Child Survival Program. Unlike many children in the community, Oswamène’s twins are in good health. Mosquito nets provided by the Child Survival Program, and the malaria-prevention training that Oswamène received, are crucial for protecting her babies from the deadly infection. Oswamène joined the Child Survival Program when she was four months pregnant. “Before I joined the Child Survival Program I did not know what malaria was about. But, thanks to Compassion, I now know what malaria is, and I also know how to protect my children from catching that deadly disease. “I learned that a female mosquito called anopheles is responsible for the malaria disease. In order to protect my children and me from catching that disease, I need to keep my home environment free from water holes. All of the mothers in this program have received training about malaria prevention and have received mosquito nets for their children. As a result, only one case of malaria was found among Child Survival Program children during fiscal year 2011-2012. Haiti has the western hemisphere’s highest mortality rates for infants under 5 years old and for mothers. Diarrhea, respiratory infections, malaria, tuberculosis and HIV/AIDS are the leading causes of those deaths. Malaria, nearly non-existent in many other Caribbean countries, remains the third-leading cause of death for children under 5 in Haiti. Haiti lacks the public health, sanitation and human resources needed to deliver crucial preventive health and medical services to the population. There are only 2.5 doctors and 1.1 nurses per 10,000 people in Haiti. Despite the Public Health Ministry’s effort, what remains even more challenging is educating the public about disease prevention. Since more than half of the population has no access to medical care, education about preventing diseases such as malaria is crucial to reducing the infant mortality rate. 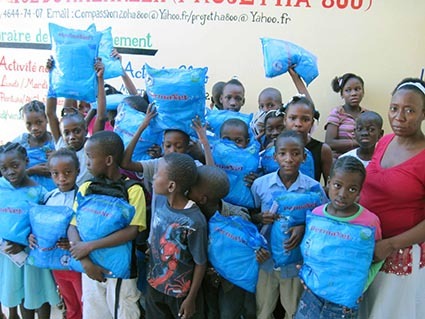 Several years ago, we undertook a massive distribution of long-lasting, treated mosquito nets with the support of Haiti’s Health and Information Program, and provided malaria training for more than 500 primary caregivers. As a result of this initiative, malaria rates dropped drastically among children registered in our program. Today, however, malaria cases are slowly picking up again due to frequent floodings, drug-resistant parasites and the lack of education. But we are committed to responding to the need through a massive distribution of mosquito nets to the most vulnerable beneficiaries. 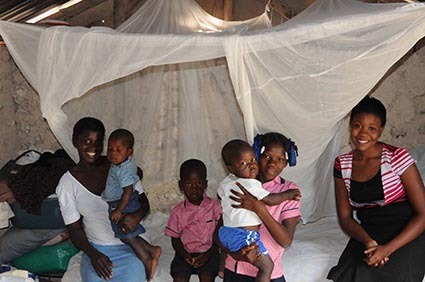 All 3,153 Child Survival Program mothers in Haiti have received mosquito nets and training about malaria awareness. According to a ministry survey conducted before the distribution of nets, a total of 174 cases of malaria were detected. After the nets distribution, the malaria cases reduced to 97. Nerlouine believes that, besides the distribution of mosquito nets, education about disease prevention is the key to preventing deaths among the children. The reason for this is that some parents who received mosquito nets neglected to use them properly or did not use them at all. Prev Post:A Creative Writing Assignment for World Malaria Day 2013Next Post:Malaria Bites! Bite Back.